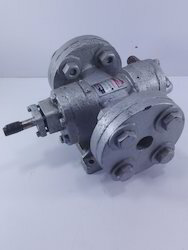 Our range of products include gear oil pump, oil transfer pump, helical gear pump, double helical gear pumps, stainless steel gear pump and internal gear pump. 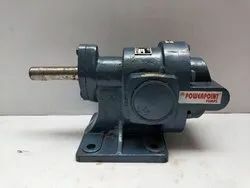 "POWERPOINT" Rotary Gear Oil Pumps are helical gear pumps meant for handling of viscous liquids like oil,alkali etc.Our pumps are available in sizes of 12mm upto 100mm port sizes.Pumps are available in SS & Cast Iron Moc. 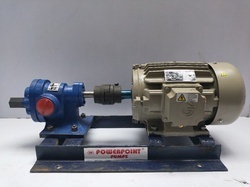 "POWERPOINT" range of Oil Transfer pumps are used for viscous liquid applications.Liquids of high density like Oil which are above 50 cst require geared pumps, which are also known as Oil Transfer pumps. 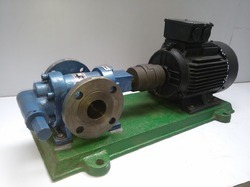 Pump Model Inlet Outlet Size Capacity Recommended Motor HP At Differential Pressure Of 'X' kg/ cm² With 1500 SSU Viscosity & Specific Gravity @ 0.8g/CC WT. 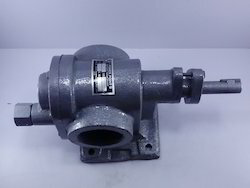 of Bare Shaft Pump in KG. 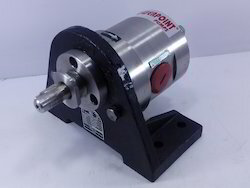 "POWERPOINT" Double Helical Gear pump is self priming positive displacement pump with positive pressure chart eristic. 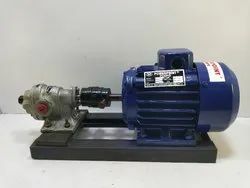 the capacity of pump is directly proportional to the speed and remain constant regardless of differential pressure the difference between theoretical and delivered capacity in the slip of the pump which depends up on the pump speed. 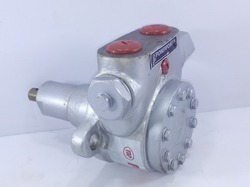 Differential pressure viscosity of liquids working clearance & workman ship the pumps are capable of handling any viscosity the slip reduce with viscosity of the fluid share. 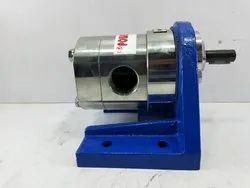 The pump has a self priming capability however some net in let the pressure available must always equal or exceed to the pumps required NPSH to avoid cavitation depending up on the viscosity of the liquids to be pumped & pump speed. 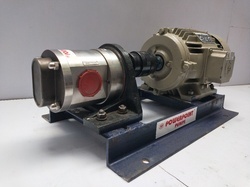 "POWERPOINT" Rotary gear pump type PGSS is a self priming bi directional positive displacement pump in all ss-316 construction case nitrated Shaft & gear supported on either side of 4, nos teflon coated self lubricated dry bush bearings. 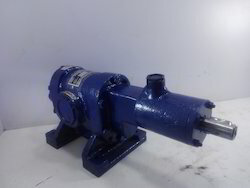 This pumps are simple construction easy cleanable the back cover can simply be removed by 4 nos hex bolt. 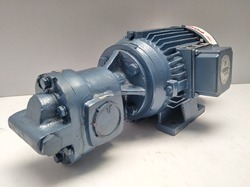 All PGSS series pumps are designed to run at 1440 RPM for liquid having low viscosity up to 500 cst pump Size up to 1” can be safely be run at 1440 RPM even at higher viscosity up to 1000 cst for size above 1” reduce the speed to 960 RPM for viscosity up to 1000 cst for higher viscosity consult the manufacturer to avoided cavitations & over loading. 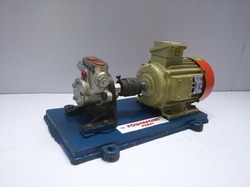 These PGSS series pumps are ideally suitable for handling viscous chemicals like mild acid , fenol etc in chemical industries , food products like , ghee, butter, vegetable sauce , kanji, fruit pulp, ice cream , vegetable oil, these are also used in pharmaceutical industries for handling, glycerin, glycol, glucose, sugar solution, syrup etc. 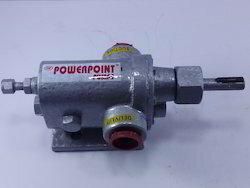 this pumps also used for handling printing ink dyes, slurry, kerosene, neptha etc. Viscous & Semi-viscus Liquids like LDO, FO, HSD, Lubricating Oils etc. 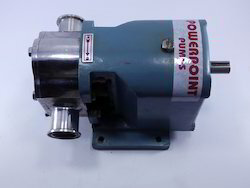 POWERPOINT offers a range of high quality positive displacement gear pumps for fuel injection in industrial burners. These pumps provide fuel at finely controlled pressure and flow rates for optimum combustion resulting in long term fuel saving and reduced pollution. NOT FOR USE WITH ABRASIVE OR CORROSIVE LIQUIDS OR LIQUIDS WITH SOLID MATTER. MANUFACTURED FROM SPECIALLY SELECTED MATERIALS AND PROCESSED TO CLOSE TOLERANCE S FOR A LONG. TROUBLE FREE WORKING LIFE. BODY AND COVER MADE OF CLOSE GRAINDED. GEAR AND SHAFT ALLOY STEEL, HEATTREATED. MECHANICAL DYNAMIC SEAL FOR HIGH TEMPERATURE & HIGH SPEED USE . BRONZE BUSH FOR LOW FRICTION AND LONG LIFE. STANDARD MOUNTING DIMENSIONS EASY REPLACEMENT. 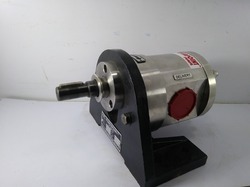 Gear Oil pumps are used for transfer of Viscous liquids namely oils,alkali etc. We are one of the widely acclaimed traders, suppliers and wholesalers of Burner Pumps. 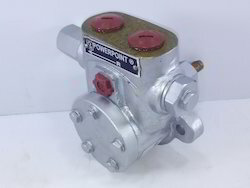 The offered burner pumps are single helical geared pumps which are commonly used for pumping and transferring the burner oil. 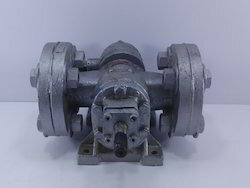 Our supplied burner pumps are highly acclaimed and liked by the clients, due to the optimal pumping capacity and durability. 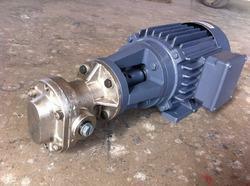 We are one the well-known traders, suppliers and wholesalers of Bitumen Pumps. 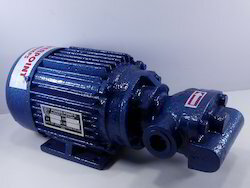 The offered bitumen pumps are unique fabrications for facilitating the pumping of liquids. Our supplied bitumen pumps are made from superior grade raw materials, procured from very trusted and reliable vendors in the market. 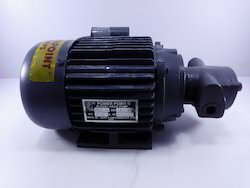 • Pumps are meant for high Mechanical Effiency means less energy Consumption, Lower Cost Smaller Motors, Lower Drive Costs. • Easy-clean pump head which is ideal for in place cleaning, or can be rapidly stripped for manual cleaning, without disconnecting the pipe work. • Positive, Uninterrupted Displacement by specially designed rotors creates a steady, gentle pumping action which does not shear, agitate or aerate the product. • Pumping chambers without pockets or crevices to harbor bacteria or contaminants. No Contact between moving parts and no internal bearings in pump head. 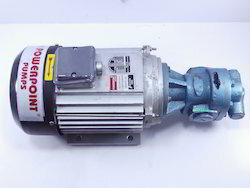 • Solid stainless steel, ASI 316 quality, pumps head, rotors and shafts. Food quality rubber covered and plastic rotors are also available. 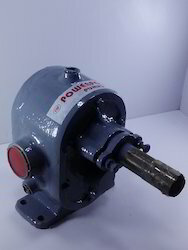 • Robust, Cast Iron gear case enclosing oil Lubricated rolling bearings are precision timing gears. • Generous distance separating the pump head from the gear case. 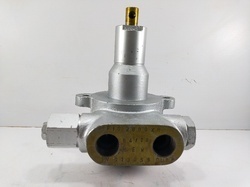 • End Connection / Port Flanged / Threaded – Customized. 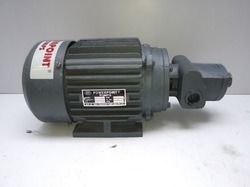 Pump size: 2" x 2"
Pipe size 1/2" x 1/2"
Looking for Gear Pumps ?